Just outside of Plettenberg Bay, Tenikwa Wildlife Awareness Center is one of several beautiful nature reserves and protected areas along the Garden Route. It is also one of the few animal welfare centers in South Africa, where both land and marine life can be found. The story of Tenikwa began in 2002, when the founders of the station moved to the Garden Route and discovered that numerous animals required their help, many of them rescued pets who could no longer be released into the wild. They bought a small piece of land and started to take in some animals and a few years later, the Tenikwa Wildlife Awareness Centre opened. A big focus is set on introducing visitors to the different types of African wild cats, such as leopards, cheetahs, servals and caracals, but there are also several other species including penguins, meerkats, storks and monkeys. The center educates about their way of life and the threats they are exposed to. Additionally, it teaches the local population how important the protection of these animals is. Tenikwa offers various guided tours in small groups and for all ages. There are special tours for photographers and families with kids, but there is also a one hour long standard tour which doesn’t need booking in advance and brings visitors closer to the animals. Let yourself be carried away by the passion the employees have for the rescue of these animals and try to do your apart by contributing to the protection of the African wildlife. Tenikwa Wildlife Awareness Center is open every day of the year from 9am to 5pm. It is located about 30 minutes outside of Plettenberg Bay and to get there, follow the N2 north-east for about 20 kilometers and turn right at the Kurland Village turnoff. From there, continue on the Forest Hall road and take the right road when it forks. Learn about the lives of South Africa's wild cats on a 1-hour guided 'experience' tour of Tenikwa Wildife Centre, along the country's Garden Route. Enter the habitats of various cats such as cheetah and caracal and get up close with lions and leopards while your guide provides details on each species and their roles in the environment. You'll also have an opportunity to see meerkats, marabou storks and visit a penguin splash pool. This walking tour is ideal for families or anyone wanting to learn more about these carnivorous creatures. Embark on an interactive photography tour of Africa's wild cats at the Tenikwa Wildlife Centre, just off from South Africa's famed Garden Route. Enjoy a leisurely 2-hour opportunity to snap up-close photos of cheetahs, leopards, lions, caracals and servals in a stunning natural environment. If you need some extra time with a specific animals, staff will be happy to arrange it. Enjoy a private leisurely tour of Tenikwa and learn about the indigenous wild cats of South Africa. Discover fascinating facts about fynbos and it's cultural uses in the community while the guides prepare you for a chance to observe the cheetahs as your paths cross in the fynbos. Enjoy sun downers to the sound of lions roaring in the distance. Breakfast to the sound of the forest awakening. The Overnight Family Adventure is a unique Parent Child bonding experience.The family will learn about the wildlife that call Tenikwa home as well as their conservation status in the wild. They will experience the unique indigenous forest at night. 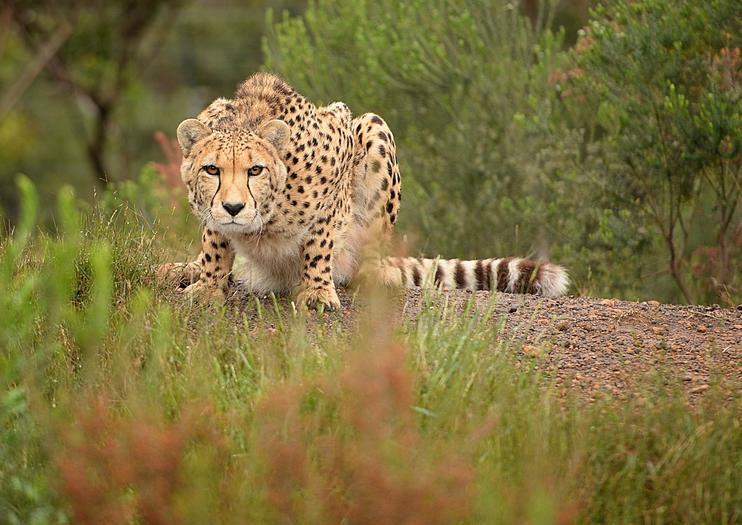 During this unique tour you will learn about fynbos and its uses in the local community whilst being prepared to observe the cheetahs on their daily enrichment walks. You will get a healthy bush breakfast afterwards. The second part of the tour will take you to visit the Indigenous cats of Tenikwa and learn how their wild counterparts has to adapt to an ever changing world. Spend 2 nights at the Tenikwa Lodge and during that time you will learn about fynbos and it's cultural uses in the community whilst being prepared to observe the cheetahs as your paths cross in the fynbos. You will spend time learning about the indigenous cats of South Africa as well as seeing the work that is being done in our wild life rehabilitation center. Help the guides doing enrichment exercises with the animals that call Tenikwa home. Get an opportunity to amazing wildlife photos on this sunset tour. Learn about the facility's cheetahs through guided commentary while snapping photos that will make great take-home souvenirs. After the tour, relax with snacks and refreshments. You'll be with an ultra-small group of just four people, which guarantees personalized attention from your guide.